Members of the TLC pose with Mrs. Berty and Mr. Modrak to honor Berty's award. The Trinity Leadership Committee (TLC) is proud to announce that Trinity’s own Mrs. Mary Ann Berty is the recipient of the 2019 Pittsburgh Adviser of the Year Award for the Students in Action program of the Jefferson Award Foundation. This is Berty’s second straight year receiving the award. To be eligible to win the award, students had to fill out paperwork for the TLC organization to compete for the finals in the Jefferson Award. The paperwork was then evaluated by a National Committee to finalize the top schools in Pennsylvania. Because Trinity made the final round of competition, they were among the top three schools to compete. On April 4, 2019, after a PowerPoint and oral presentation, the three school finalists had to then assemble a video informing a committee of why Berty and the TLC should win the award. Once the videos were received, the committee voted on the content of the video. Trinity’s video was put together by Sophomores Madyson Frazee, Joie Engle, Emma Malinak and Lucie Towers, as well as Juniors Ann Kozak and Bayli Miles. Congratulations to Mrs. Berty on earning the Advisor of the Year Award in back-to-back years! 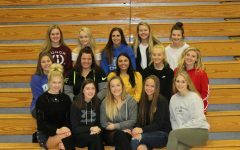 Students interested in joining Trinity’s Leadership Committee for the 2019-2020 school year should see Mrs. Berty.